Everything UWA students and staff need to know about parking, permits, fees and fines. Public transport is your best option if it's a viable alternative, because it may only be possible to find parking if you get to UWA early, are prepared to wait or walk. Student parking - find out if you're eligible for a student parking permit and how to apply. 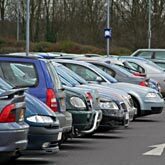 Staff parking - find out if you're eligible for a staff parking permit and how to apply. Temporary parking permits - for existing UWA parking permit holders only. Parking Authority permits - permits for non-students and staff. Special (other) permits - accessible, official business, reserved bay and new staff permits. Special parking arrangements - buses, conferences, theatres and other University venues. Parking areas - where to park on campus. Parking fines (infringements) and appeals - infringement types and how to pay. Parking permit fees - the cost of different permits. Vacation parking - information about parking during the semester breaks. For your permit to be valid, it must be fully affixed to the lower left-hand corner of your vehicle's windscreen (using the self adhesive on the permit). No other method of affixing the permit is accepted. Temporary parking permits must be placed on the dashboard so that all the details of the permit are clearly visible from outside of the vehicle. the permit has been lost. Documentary evidence of the accident or repair may be required. The old permit must be removed from the windscreen and returned to the UniPark Office. If the old permit is not returned, or the permit has been lost, an administration fee of $11.00 will be charged and a statement must be provided about the old permit.